There is so much ‘noise’ in the perfume industry in this day and age that it gets increasingly more difficult to pay attention to the cacophonous din of new launches and brand new niche brands. In order to rise above the noise many niche brands are resorting to ‘clever’ (read: annoying) gimmicks to make their wares stand out from the crowd, ranging from perfumes inspired by blood types (see Blood Concept) to scents that aren’t supposed to be perfumes (see Juliette Has a Gun). Rarely is the product allowed to speak for itself. Still, for each naff niche brand there is a decent one with high quality products (brands like Arquiste, 4160 Tuesday’s and Maison Francis Kurkdjian to name just a very small few) that allows for the beauty of their scents to be the element that sets them apart from the many other bottles they share their shelf space with. These refreshing outfits remind one that within the crowds and crowds of scent on the market, there are individuals with a passion for perfume and a unique voice waiting to be heard. One such brand is Papillon Perfumery. Created by New Forest perfumer Liz Moores and launching this year, Papillon has three perfumes devoid of any bells, whistles and gimmicks – they are simply expertly crafted and beautiful perfumes that truly speak for themselves. The perfumes (Angélique, Anubis and Tobacco Rose) prove that familiar themes can still be presented in unique ways if one just approaches them in an entirely different manner. Angélique is an iris perfume like no other. Where most irises focus on the ingredient’s sweet powdery or rooty vegetal facets, Papillon’s take on nature’s most melancholic flower sees the note placed in a more fascinating and fruity setting. That’s not to say this is a vibrant and juicy take on the note, as Angélique plays out an iris painted in the purest of pastel shades. In the opening stages, Angélique portrays an earthy iris touched by wine-like mimosa. It’s air is thick with sweet pollen and spicy black pepper, making for a textured mix of contemporary fizz. This creates an interesting tension where one half of the fragrance feels subdued, almost as if it is slumbering softly, whilst the other is positively alive and buzzing with kinetic energy. The fruity aspect comes from the chewy apricot melody of osmanthus. Here it is less jammy than it usually is and more stewed. Incense adds a cool, grey feel supported by a silky suede undertone that spans most of Angélique’s development. It is the most unusual take on iris I have tried to date and one would imagine that it would be the most divisive of the three Papillon perfumes. But polarising perfumes are arguably the very best and this one will certainly have people talking. Personally, I think it is fabulous – a truly pale iris of the highest order. Anubis (let’s all agree now that ‘Anubis’ is a wonderful name for a perfume) opens with smoke, smoke and more smoke. It sombrely burns with embers of age-old resins, salt and black tar but there is a softer side – a lightness and sweetness that boldly peeks through the hot coals to add wisps of coloured vapour. In its opening minutes though, Anubis is enveloping, comforting and wildly beautiful, hinting at ancient times so strongly that it feels like its name should be written in hieroglyphics. But smoke isn’t all that Anubis has to offer as part of its oeuvre, in fact burning embers aren’t even the scent’s most defining characteristic once it has had a chance to unravel on the skin. With time, an unusual and beguiling blend of jasmine-soaked leather takes centre stage to provide a multi-faceted contrast to the smoking resins. This floral leather (which becomes more suede-like with time) tempers Anubis’ rougher edges and allows for a smooth finish all round. Things soften considerably in the base with labdanum, benzoin and the soft suede. Flashes of saffron flicker amongst the flames, but for the most part there is less zing and more comfort as things dry down. Thankfully Anubis doesn’t veer in to creamy vanilla territory (as so many fragrances of this ilk do), instead relying on a beautifully dry array of resins and spices that provide a strong, powdery bed that lasts for hours and hours. I can foresee that Anubis will be the fan fragrance amongst perfume nerds. It is bold, edgy and genderless enough to be the scent in the collection that will grab the most immediate attention but it has substance as well as style and is so expertly pieced together that it truly feels like a seamless composition. Wear this one for when you want to ensnare a lover or simply when you want to cuddle up in a blanket of smoky warmth. Let me start by saying that I am obsessed with Tobacco Rose. OBSESSED! It is the rose scent that sent me swirling off on my recent rose kick and it is nothing short of addictive. For her take on the humble rose, Liz stated that she wished to “defy typical perceptions of rose fragrances”, saying that the genre is often seen as “outdated”, and with that she has a point. Rose fragrances are often seen as old-fashioned nowadays, with the mainstream pretty much avoiding the genre and only a handful of niche offerings being worthy of exploration. 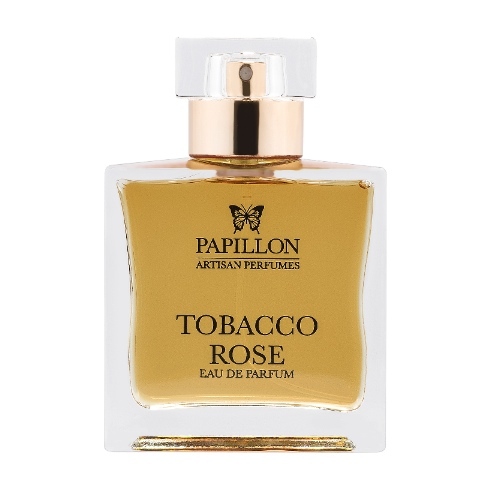 Tobacco Rose however, is most definitely a rose fragrance of note and it’s easily my favourite of the Papillon trio. What makes this particular take on nature’s most famous red flower so wonderful is the fact that takes a straightforward rose accord and turns it on its head, making it something brand new by adding a few small and unique touches that have a big impact. These little inflections – a touch of minty geranium, a dab of beeswax and strips of cold metal – bolster the rose, strengthening its many nuances and ultimately making for an exciting new presentation of the flower. They also give Tobacco Rose a multi-faceted feel, meaning that it appears to be refreshing (thanks to the geranium), metallic, oriental and vegetal all at once. It’s complex but not hard to handle in any way, in fact it is effortless in its wearability and feels suited to almost any occasion. In the base, Tobacco Rose treads on familiar but welcome territory. It captures the essence of the rose in all of its sweet and powdery glory and even throws in a touch of moss for good measure. In short, this is one infinitely beautiful rose that manages to bring something new to the table at such a late stage in the game. It’s fragrances such as this that make the perfume world such a wonderful world to be in. I for one, am well and truly smitten. 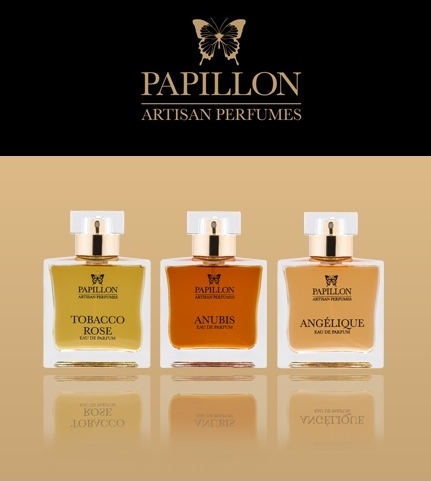 Papillon Perfumery’s Angélique, Anubis and Tobacco Rose are all set to launch this year in Eau de Parfum concentration. Images, notes and samples via Papillon Perfumery. 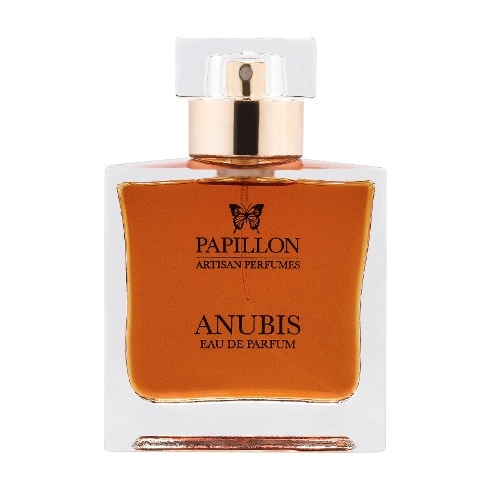 Posted in Papillon Perfumery, Perfume Reviews and tagged Angélique, Anubis, Iris, Liz Moores, Oriental, Papillon Perfumery, Perfume Review, Rose, Tobacco Rose, Unisex. Bookmark the permalink. You make these perfumes sound very interesting (I think these are one of the first lemmings forme this year). Just three perfumes in the line is a good start! I’ll be curious to try these. It’s refreshing to see a brand launch with a small capsule collection, I agree. There’s nothing worse than seeing one that starts with six or seven – you just know they’re not going to be good. These ones are definite lemmings, especially Tobacco Rose. I will definitely try those when they become available, especially the iris. And Anubis is indeed a good name. It really is a good name, isn’t it? I’m surprised that nobody has thought of it before. These will be definitely worth trying when they come out. They sound great, can’t wait to try them! Hehe! The Iris is right up your street! I’m hoping that they will be reasonably priced, too. Briefly poking my nose out of the lurkers’ grotto. I sense something in the air compelling me to rouse myself from hibernation. Lovely review, and I thank you for bringing these to my attention. It’s so exciting to hear that you are smitten! I suspect I will be as well. Hi Holly, thank you for de-lurking! These will most definitely be worth a sniff when they come out. Aren’t they just the bees knees!?! No need for bells and whistles with these, they are out of this world without a rocket. Dearest Dandy, I agree with all of the above! I was really intrigued to read about Liz’s upcoming collection having heard her talk at a PLL event quite a while ago. All three sound great but I’m particularly interested in Anubis. Thanks for the heads-up, Thomas. You’re welcome! Anubis really is quite something. OOH these sound too wonderful! Especially Anubis and Tobacco Rose. And yes to the great name!! Does Anubis mean something? Oh, I just looked it up. The Egyptian God of the Dead, in Jackal form. Wow. Do let us know when these babies become available, Please!!! Your review has me drooling.